I am a foodie and it seems to me that travel and food just go hand in hand. 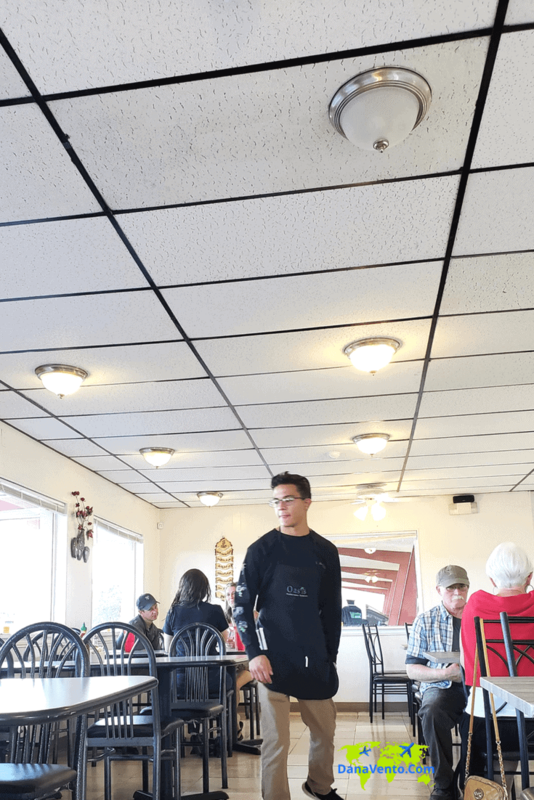 Now, our trip to Gallup, New Mexico had me on a path of both adventure and eating. Around every corner of the downtown district is a surprise waiting to be found. 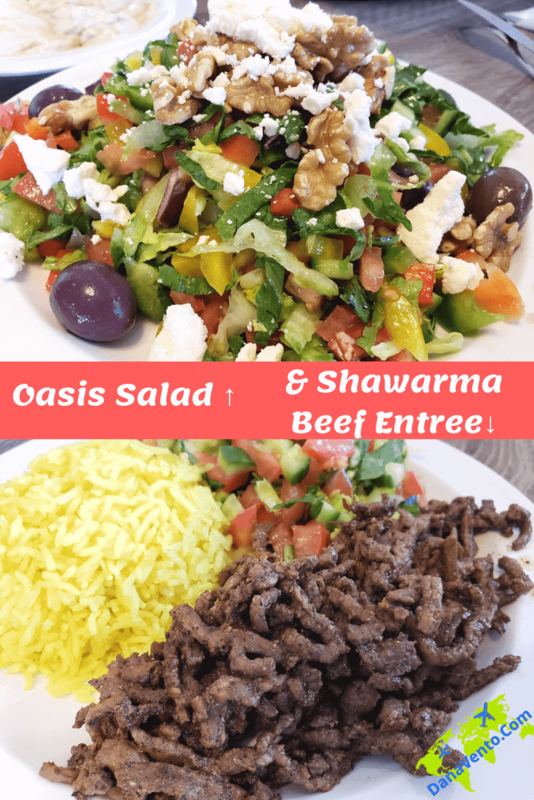 Today’s story is a gem of a Middle Eastern/Mediterranean foodie find! After a full day of ‘play’ outside great eats are a must. Now, you can be overwhelmed by the Gallup area, if you don’t plan ahead. There are a lot of good places, but only a few can be great. 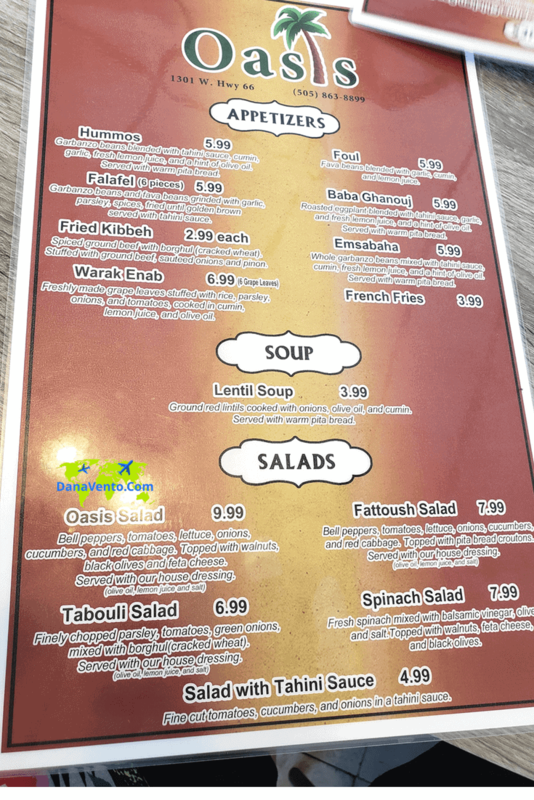 For those that love simple Middle Eastern Food and crave unpretentious surroundings, do I have the place for you! 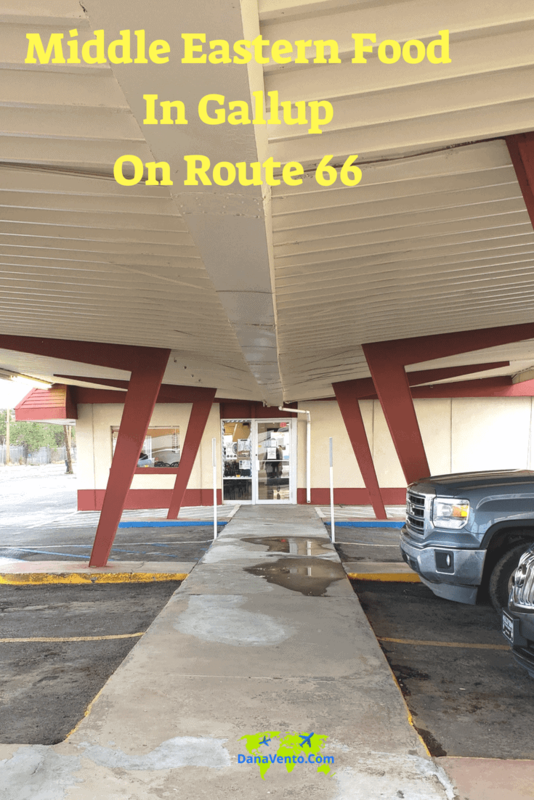 Lavishly live culinary travel out loud along Route 66 in Gallup, New Mexico. 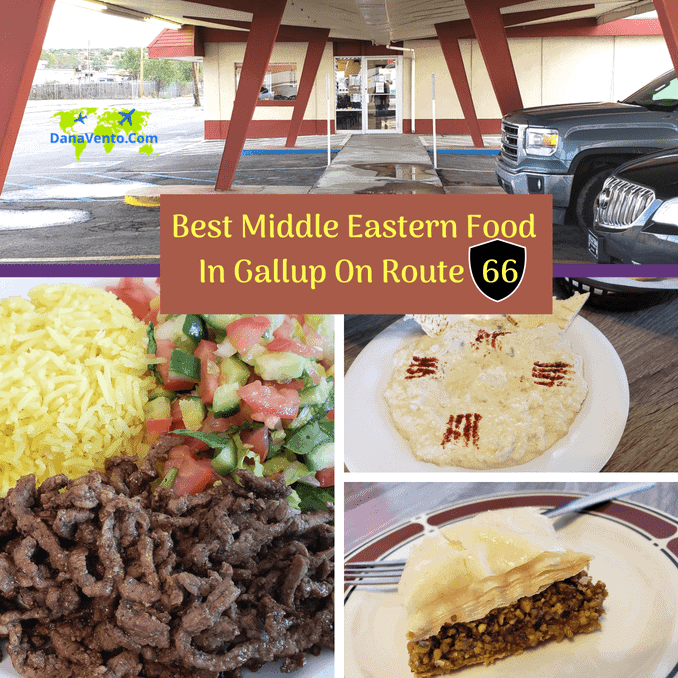 Here’s where to find the Best Middle Eastern Food in Gallup on Route 66. 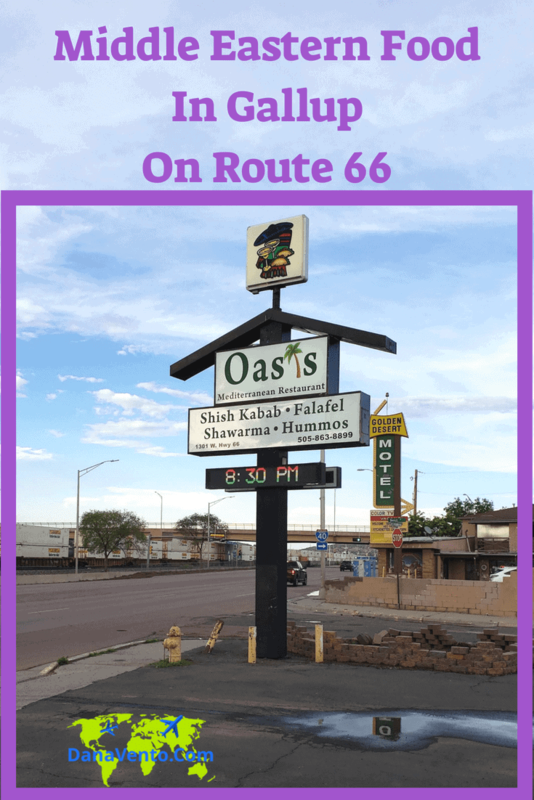 Thanks to our host for a great meal at the Oasis Restaurant in Gallup on Route 66. For all of you traveling along Route 66 as a couple, with friends or for family travel, I am sure you will find something for everyone! My teens are hungry round the clock, add in the adventure component and they get hangry! We headed out of our hotel and stayed on Route 66. 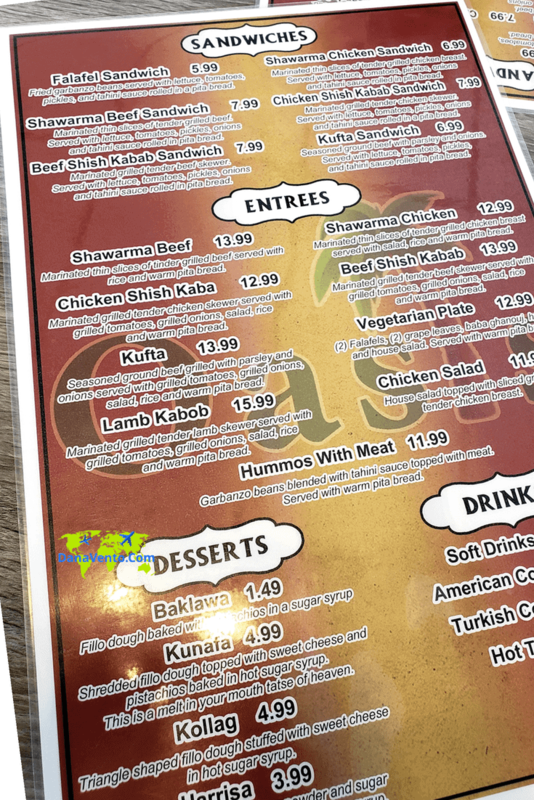 Our destination was the Oasis Mediterranean Restaurant. Trust me, don’t shy away because the outside looks like an abandoned Sonic. The outside is a thankful disguise for what’s inside. Thankful because if everyone knew what was inside you would NEVER get a seat. First and foremost, our server (and we did not get his name) was outstanding. So were the other ones working that night. Everyone is friendly and ON their A-Game. Refills are not an issue. You will only ‘get’ this restaurant if you go there. I am truly impressed by the service at everyone’s table. Next, meals are prepared quickly and super fresh. All good things to know about a destination. Additionally, there was a constant crowd of both takeout and dine-in during our 1 hour there. There are about 10 tables or so, and each of them is set up for parties of four. Additionally, this place jumps with business round the clock, so plan on that as well! The atmosphere is simple, tables and chairs. You seat yourself and then you are waited on. That’s it. Here’s the menu, and there are a lot of options. Where Niko Travels ate here without issue. They use vinyl gloves not latex and had chicken so we were set! Food allergies need to be addressed at the beginning of the conversation, but they were able to accommodate my son who has severe food allergies. Also, let’s flip the menu over to the back, there you will find sandwiches and entrees and of course beverage selection. 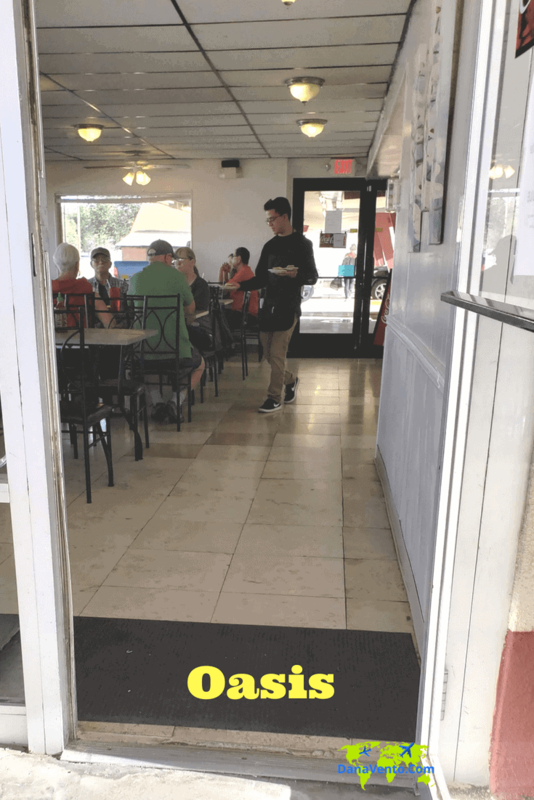 There are a lot of options and as I mentioned they can prepare allergen-friendly eats, so this is a great location for everyone! It’s called Baba Ghanouj and it’s sinfully delicious. KallieVXo and I dug right on it. The pita bread comes with it for your dunking pleasure. Even when we finished the pita bread with it, they offered us more, no issues there. I’ve eaten Baba Ghanouj many places, but here has been the truest to its textures as well as flavor. You just gotta! 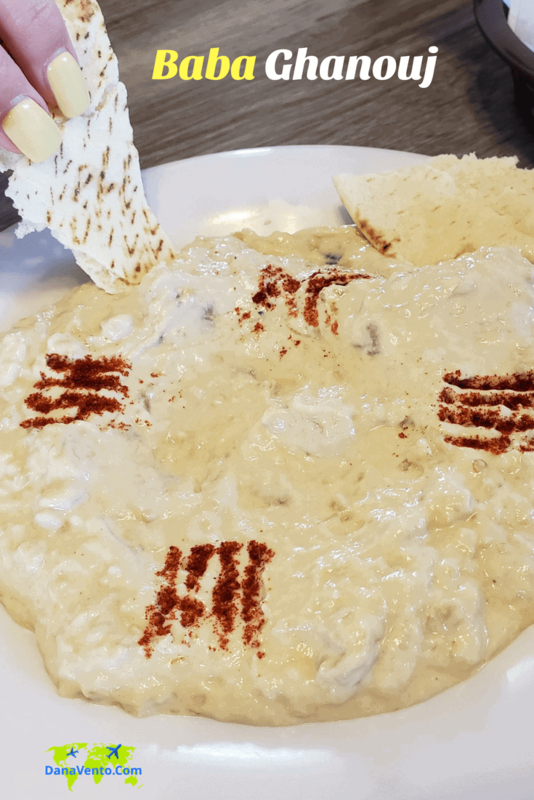 Pita Bread pieces that you dunk on into their Bubba Ganoush. In case you want to know the general overview of ingredients: roasted eggplant, garlic, tahini sauce, and lemon juice, plain and simple. Truly filled with YUM! I am happy that he was able to enjoy a meal here and that we could eat as a family without having to bring a meal along. He could have had a salad as well but he opted not to do that. So there are many choices, this is just one he ate. 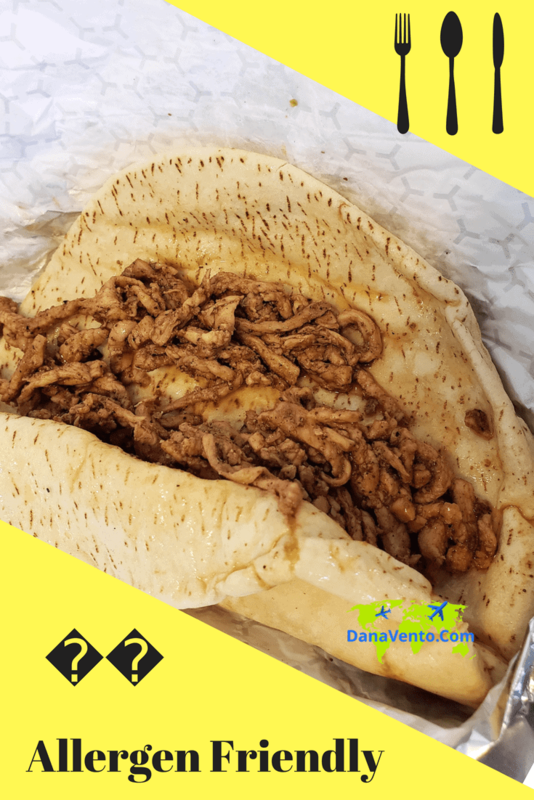 MJ Travels decided to eat the entree of Shawarma Beef Meal. Served up with rice and warm pita bread! Yes, he ate it all! It was really delicious. You can see the care and time spent on the beef, as it was very small strips. The seasoning was not overpowering if you are wondering and the rice was cooked to perfection. I am sure you can see that in the imagery, it was just photo exceptional! Additionally, you can see these images live on my Instagram Feed. As a salad junkie and a vegetarian, I continue to seek out new foods to me on the menu. I ate the Oasis Salad. The presentation of bold colors is incredible. Created of Bell Peppers, tomatoes, lettuce, onions, cucumbers, and red cabbage. (I peeled off the walnuts). The feta was exceptionally fresh as were the black olives and house dressing. Really fresh, really colorful and totally delicious. I would eat this salad again or perhaps try a different one for some variation! 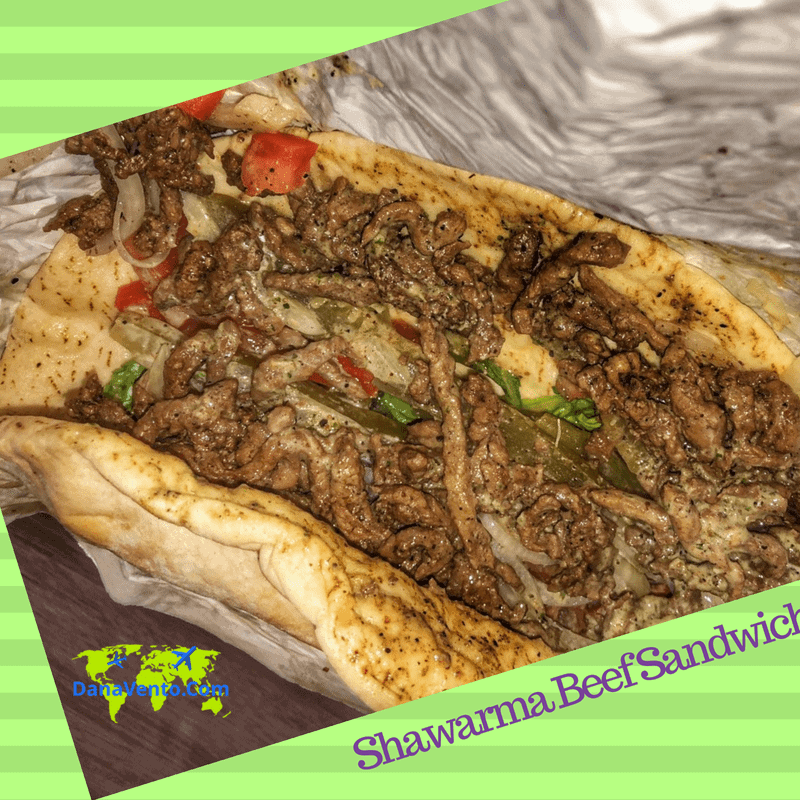 Shawarma Beef Sandwich is what KallieVXo enjoyed. Wrapped tight in a pita and just beckoning you bite after bite. You can see the ingredients, it is simple and delicious. Additionally, since she had snacked on the appetizer, this was plenty. 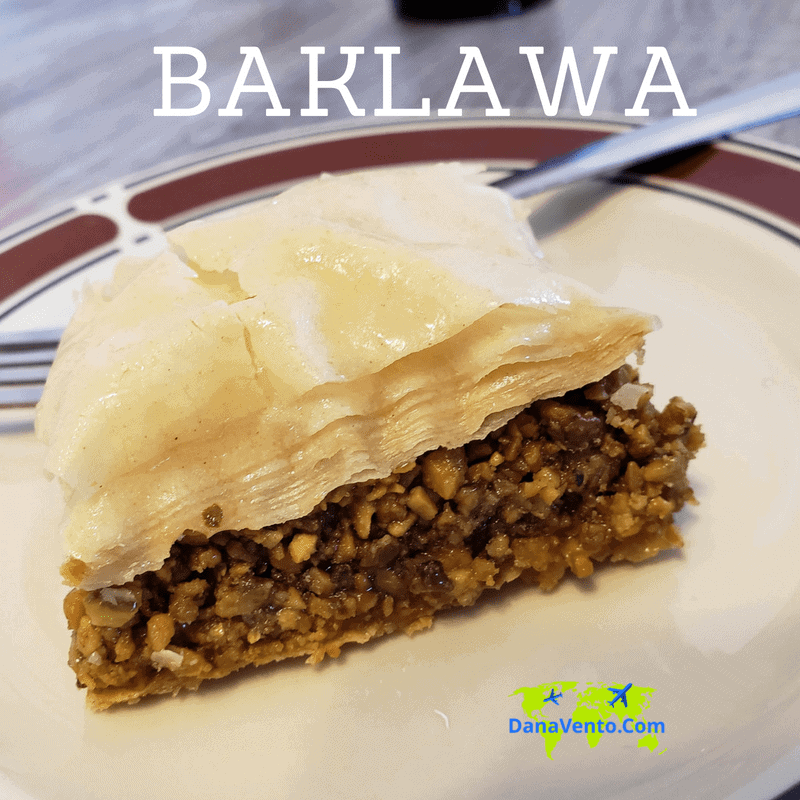 No meal is complete without a great finish and we chose, Baklava. Fillo dough baked with pistachios in a sugar syrup.. All I can say is we are all craving more of this delectable. It’s not a large portion, but good for a few forkfuls each! Oh gosh, the baklava looks absolutely delicious. My mouth is watering!